TOZ - So called, after the measurement of gold in troy ounces - 'Toz'. 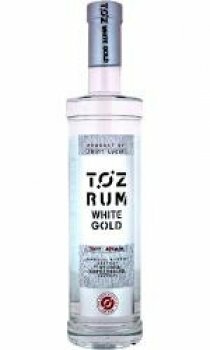 Toz White Gold is a blend of aged, premium rums. Distilled in copper alembic pot and continuous stills, the rum is aged in American white oak barrels before a final polish in vintage port casks. The rum is then gently filtered to remove colour and to give a fresh citrus character with hints of sweet raisin and vanilla.